guide. 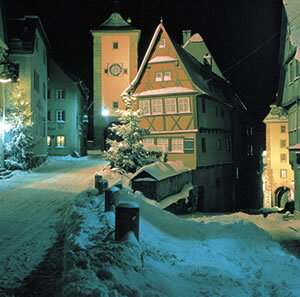 Transfer onto the quaint medieval city of "Rothenburg ob der Tauber", where you will then check into your hotel. Rest of the day will be at your leisure to explore the romantic Christmas market . Evening, welcome meeting followed by dinner at the hotel. Overnight in Rothenburg. In the morning we will take you on a short walking tour of Rothenburg. After lunch, which is not included, we depart for a pleasant drive to Nürnberg. 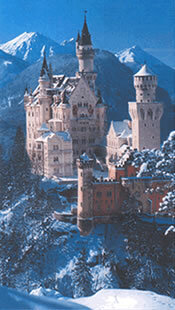 This medieval Bavarian city hosts the world's largest and one of the most famous Christmas markets. Arrival back to Rothenburg will be late afternoon. Dinner is not included. Overnight in Rothenburg. After breakfast we will drive along the Romantic road towards Munich. A lunch time stop will be made at the baroque city of Ulm and a visit to the famous Cathedral is a must. 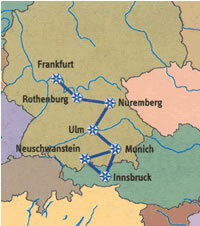 We then continue via Augsburg onto the Bavarian capital. Check into your hotel at Munich and the remainder of the day is now your own. In the evening you will have dinner at the famous "Hofbrauhaus" and enjoy a typical "Bavarian evening" with entertainment. Overnight in Munich. residence of the Bavarian kings. In the afternoon you can enjoy the delights of the Munich Christmas market. Dinner not included. Overnight in Munich. visit to the Swarovski Crystal Worlds. The afternoon will be free to explore the city at your own leisure and maybe take the opportunity to buy some last minute souvenirs. In the evening you will enjoy a private advent concert at your hotel, which will be followed by a Farewell dinner. Overnight in Innsbruck.